A KAIST team presented a noninvasive light-sensitive photoactivatable recombinase suitable for genetic manipulation in vivo. 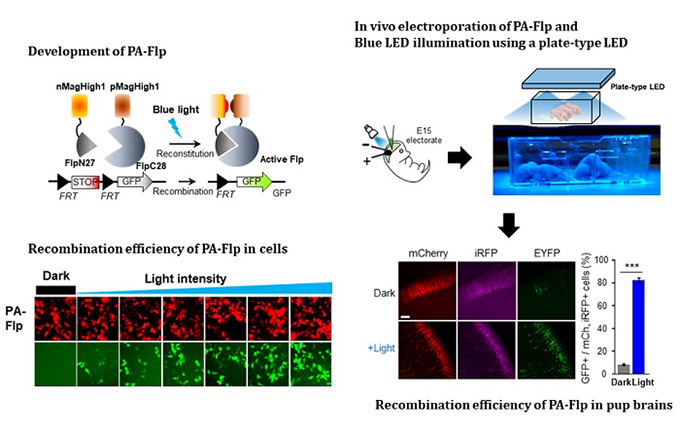 The highly light-sensitive property of photoactivatable Flp recombinase will be ideal for controlling genetic manipulation in deep mouse brain regions by illumination with a noninvasive light-emitting diode. This easy-to-use optogenetic module made by Professor Won Do Heo and his team will provide a side-effect free and expandable genetic manipulation tool for neuroscience research. Spatiotemporal control of gene expression has been acclaimed as a valuable strategy for identifying functions of genes with complex neural circuits. Studies of complex brain functions require highly sophisticated and robust technologies that enable specific labeling and rapid genetic modification in live animals. A number of approaches for controlling the activity of proteins or expression of genes in a spatiotemporal manner using light, small molecules, hormones, and peptides have been developed for manipulating intact circuits or functions. Among them, recombination-employing, chemically inducible systems are the most commonly used in vivo gene-modification systems. Other approaches include selective or conditional Cre-activation systems within subsets of green fluorescent protein-expressing cells or dual-promoter-driven intersectional populations of cells. However, these methods are limited by the considerable time and effort required to establish knock-in mouse lines and by constraints on spatiotemporal control, which relies on a limited set of available genetic promoters and transgenic mouse resources. Beyond these constraints, optogenetic approaches allow the activity of genetically defined neurons in the mouse brain to be controlled with high spatiotemporal resolution. However, an optogenetic module for gene-manipulation capable of revealing the spatiotemporal functions of specific target genes in the mouse brain has remained a challenge. In the study published at Nature Communication on Jan. 18, the team featured photoactivatable Flp recombinase by searching out split sites of Flp recombinase that were not previously identified, being capable of reconstitution to be active. The team validated the highly light-sensitive, efficient performance of photoactivatable Flp recombinase through precise light targeting by showing transgene expression within anatomically confined mouse brain regions. The concept of local genetic labeling presented here suggests a new approach for genetically identifying subpopulations of cells defined by the spatial and temporal characteristics of light delivery. To date, an optogenetic module for gene-manipulation capable of revealing spatiotemporal functions of specific target genes in the mouse brain has remained out of reach and no such light-inducible Flp system has been developed. Accordingly, the team sought to develop a photoactivatable Flp recombinase that takes full advantage of the high spatiotemporal control offered by light stimulation. This activation through noninvasive light illumination deep inside the brain is advantageous in that it avoids chemical or optic fiber implantation-mediated side effects, such as off-target cytotoxicity or physical lesions that might influence animal physiology or behaviors. The technique provides expandable utilities for transgene expression systems upon Flp recombinase activity in vivo, by designing a viral vector for minimal leaky expression influenced by viral nascent promoters. The team demonstrated the utility of PA-Flp as a noninvasive in vivo optogenetic manipulation tool for use in the mouse brain, even applicable for deep brain structures as it can reach the hippocampus or medial septum using external LED light illumination. The study is the result of five years of research by Professor Heo, who has led the bio-imaging and optogenetics fields by developing his own bio-imaging and optogenetics technologies. “It will be a great advantage to control specific gene expression desired by LEDs with little physical and chemical stimulation that can affect the physiological phenomenon in living animals,” he explained.